He was joking (a little) about that being the chillest moment of his life, but still, there was no doubt that his Balinese evening had a little more Zen to it than our Ann Arbor morning. Caroline has a cold and was up half the night. A little before midnight I decamped from our bedroom to escape the sniffling and landed on a mattress on the floor in the playroom. When we all gathered around the breakfast table at 8am the mood was decidedly grim. 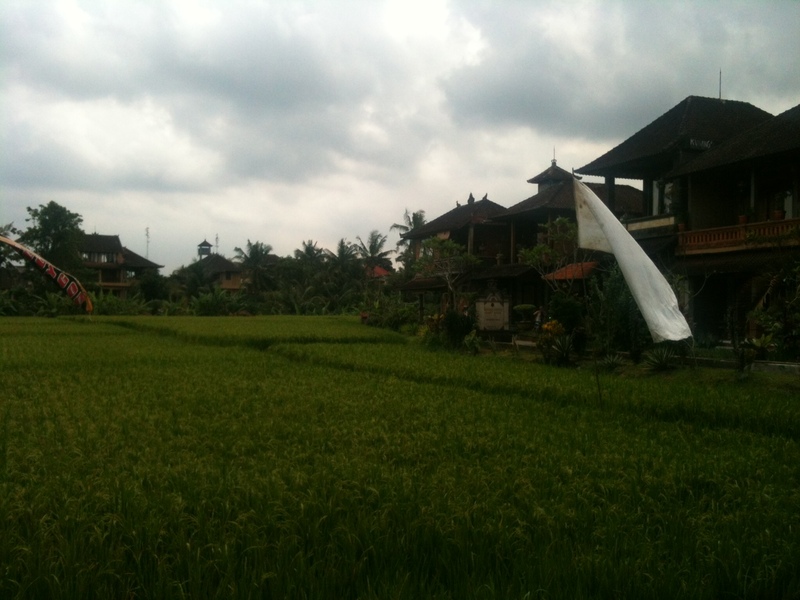 The picture from Bali stirred a gurgle of longing in my stomach. 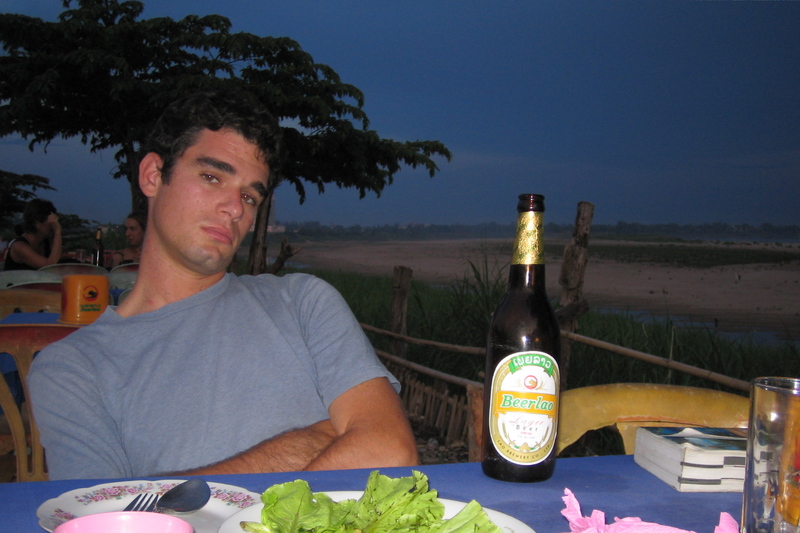 It also reminded me of an evening on the banks of the Mekong River in Vientiane, Laos eight years ago. That’s me there, in front of the big beer. Caroline was on the other side of the camera. When I find myself longing for a lifestyle that makes a perch on a river in Southeast Asia easier to come by, I remind myself that the expression on my face in that picture was hardly one of blissed out contentment. That evening, in May 2006, was at the end of a long trip. I was listless and bored and wanted nothing more than to come home and put down roots. Today I’ve swung a little far in the other direction; I wouldn’t mind a little more Bali in my life. But I also know that life with really young kids is its own temporary kind of thing and not something I want to rush past. Over the last week I’ve been reading David Maraniss‘ new biography of Barack Obama. It covers the early years- birth to age 26. At first I was disappointed that there would be no accounting of Obama’s political rise, but now, having finished the book, I think Maraniss made the right decision: Obama’s growth as a person, from a little kid running the alleys of Jakarta to a kind-of-stoner at a Honolulu prep school to a lost 20-something in New York City to the uncommonly poised and talented man we know today is a thing to behold- and certainly way more interesting than the story of how he got elected to the Senate. I came to realize that without a vessel for my beliefs, without an unequivocal commitment to a particular community of faith, I would be consigned at some level to always remain apart, free in a way that my mother was free, but also alone in the same ways she was ultimately alone. Starting a family has a lot in common with joining a religion: Both involve committing to something outside yourself, and it takes a leap of faith both to believe in God and to let love for a child serve as the organizing principle of your days. And when I think about why I wanted to give up the freedom I had in my 20s in order to become a father, I think about it in much the same terms that Obama used to describe his turn towards religion: Without an unequivocal commitment to something, or someone, outside of myself, I felt like I didn’t have any way to make sense of and live out my beliefs. A few months ago I told Caroline, who is kind when I navel gaze over dinner, that I imagine the realm of my concerns changing throughout my life like this: My 20s were about me; my 30s and 40s will be about family; and life after that will be about engagement with the wider world. This progression is obviously silly on one level. At the same time, I think that it makes sense that personal growth prepares one for family and that family prepares one for politics: Without self-knowledge it’s hard to know what kinds of values to instill in your kids; and building a family culture is a first baby step towards thinking about the bigger question of how we should all live together. I often think about parenthood as a pause between periods of freedom: Bali. Kids. Bali. But receiving that picture from my friend and reading about Obama made me realize something maybe I already knew: That what I long for most these days is not more personal freedom; it’s more engagement with the thrum and swag of American life. This entry was posted in Stories & Reflections, Uncategorized and tagged barack obama: the story, david maraniss, dreams from my father, giving up freedom, last trip before kids, traveling with kids, ubud bali, vientiane by Kevin Hartnett. Bookmark the permalink. Very thoughtful, as always. Something that circles around in my head (as I try to make a strong family culture and be a good dad) is that my heroes –say Dostoevsky, Obama, whoever– have usually accomplished great things at the same time they were fathers. It wasn’t a sequential thing, exactly. I mean, look at Obama –he’s in the middle of fatherhood and his first term. I find that alternately frustrating and inspiring. I feel that point. On the one hand there’s a vitality that comes with raising kids- being in the thick of life might lend itself to great accomplishment. On the other hand, great accomplishment requires a lot of time away from your kids. One part of Obama I’ve never understood is why he was willing to spend so many nights away from home while his kids were young (particularly when he was in the state senate). It’s not a trade I think I’d ever want to make. I suppose one thing to think about would be how often the children of accomplished people seem to be troubled –sometimes I think because it must be hard to feel a success in your own right if your mother or father is historically significant at something, but maybe the kids are troubled because the parent was “busy” for years at a time. I doubt Marlon Brando was taking his son to the grocery store or on long walks through the neighborhood, etc. I think in terms of a “trade,” like you say, it’s never as simple as a Faustian contract. . . If I’m working on something, then I can forget almost anything else for the moment, including my wife and son–but because so much of family life is undramatic and incremental, it’s sometimes hard (while cleaning up spilled cereal or folding tiny laundry) not to think about the “great work” I could (theoretically) be doing instead. As a rational decision maker, I recognize that my family is more important than my day job or even my personal dreams –but as an irrational cleaner-up of cereal, I often feel otherwise.